The Pakistani Parliament passed legislation Thursday to crack down on honor killings. The bill eliminates a current loophole in the law that allows families to forgive those who commit honor killings so they can escape prosecution. 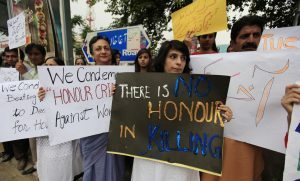 Honor killings, the act of someone killing a relative who has brought the perception of dishonor to the family, are considered murder under Pakistani law. The Human Rights Commission of Pakistan issued a report that said 1,096 women died as a result of honor-related attacks in 2015. The bill to close the honor killings loophole was first introduced and passed in Pakistan’s senate in 2015, but it wasn’t approved by the larger National Assembly. Then, earlier this year a high-profile honor killing of actress, model and social media celebrity Qandeel Baloch ignited a renewed cry of outrage. “You read about these stories (of honor killings) and often times, you can’t relate to them, but this time it was like I lost someone I knew,” said 23-year-old Iqra Shahid, one of Baloch’s avid fans who lives in Karachi, during a phone interview with the NewsHour. Heather Barr, a senior researcher for Human Rights Watch, said in a statement that the new legislation is a step in the right direction, but the Pakistani government, police and justice system must ensure it is enforced. Women in Pakistan say they are pleased with the new law, but point out honor killings are both a political and social problem. Maham Syedain, a 22-year-old psychology student at Karachi University agrees.